Audio output port. Built in Hi-Fi speaker, clear fetal heart beat sound. Accurate FHR detection, has real-time FHR mode and average FHR mode. Low cost and high performance fetal heart beat detector. Detects real time FHR and average FHR( Fetal Heart Rate). 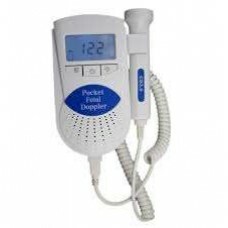 Applicable for the private obstetricians office, antepartum clinic, obstetrical department of hospital and remote monitoring situations or using at home. Large LCD Display.